This dev blog, we’re sharing the latest batch of screenshots from the new game, following the first reveal back in August. These screenshots all featured first in our newsletter, which went out last Friday – so if you want to be at the front of the queue for the latest FOTWO news, be sure to sign up using the red widget on the right. As we’ve mentioned before, what we’re showing right now is very much “first working version” – there’s a lot more work to be done and improvements to be made. To do all the things we want, though, we’re going to need help – why is why we’ll be launching our Kickstarter campaign very soon! 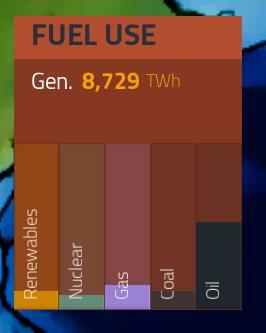 Back to today’s business: the first element we’re showing today is what we call Fuel Use. 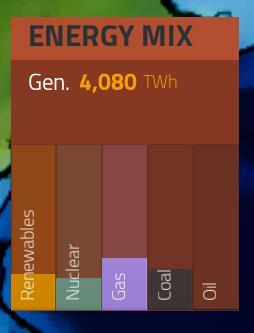 It shows you all your nation’s fossil fuel needs aggregated together, in both numerical and bar chart form. 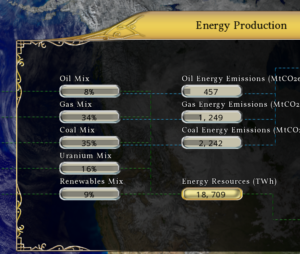 As with the Economy panel, it gives you an at-a-glance understanding of the situation, allowing you to plan your environmental and economic strategies accordingly. 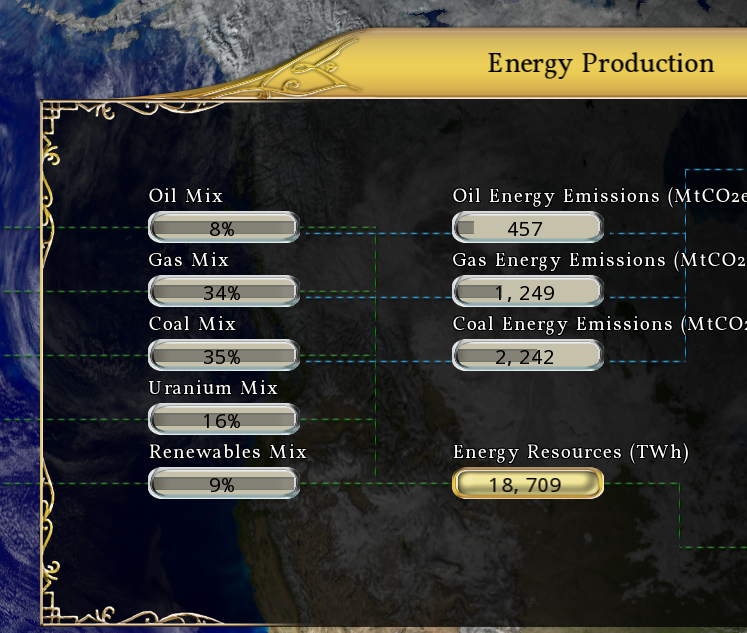 You’ll notice that the name was different (Energy Mix), as were the energy generated, and the proportional mix was very different. Why was this? Looking at the energy stats, you would never think that oil consumption was the biggest fossil fuel issue. By including transport uses in the Fuel Use panel, it becomes very clear where the issues lie, and which fossil fuel usages need addressing most urgently. 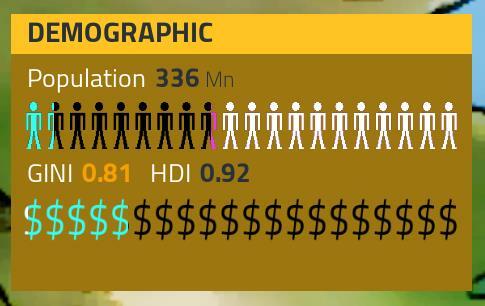 Moving on, the next screenshot is of the Demographics panel, which is all about the people who live in your nation. The Population number is self-explanatory, while the row of meeples (stick men) gives you a proportional breakdown of your society by activity. White meeples are your Dependent population (the old, the young, the sick) who rely on the support of others. The blue meeples are people who work in the Public Sector, black meeples are people working in the Private Sector, and purple meeples are unemployed people of workforce age. We anticipate all of these things being of great significance in the years ahead, especially as robots, AIs, and automation enter the workplace. Moving onto the second row, HDI (Human Development Index) featured in the last game, and is a reflection of your nation’s health, education, and welfare systems. The GINI co-efficient is reflection of how equal or unequal the distribution of wealth is in your nation. 1 is the maximum value (total inequality), so 0.81 is pretty high here. The line of dollar icons gives a visual representation of why this is. The black dollars represent the wealth of the richest 10% of your citizens. The white dollars (barely visible at the left-hand edge) represent the poorest 50%. The blue dollars are the middle 40%. Scarily, these proportions are very close to real life. In terms of appearance, there’s still a lot to be done. The icons are very much first pass, as is the colour scheme – but overall we think the panel is doing a good job of showing a lot of very relevant information in a clear and understandable manner. That’s about all we have time for now. 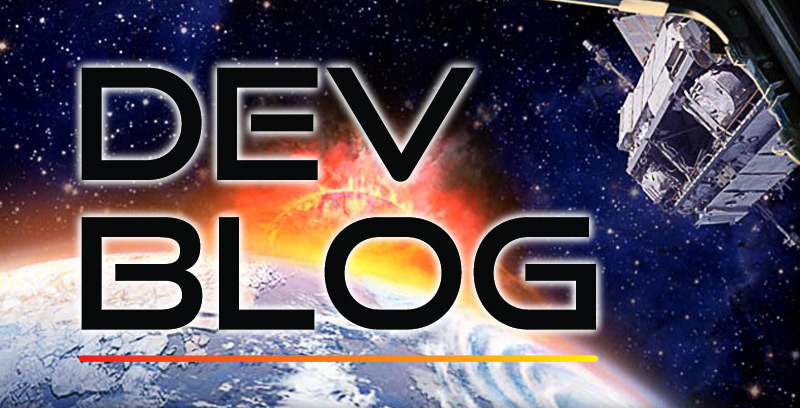 We’ll be back next week with another newsletter, where the remaining elements of the Main Dashboard will be revealed.